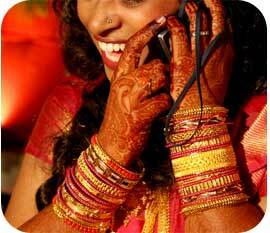 It is a well known fact that the Indian wireless industry is growing at dizzying speeds. In December 2009 alone, the Indian Wireless Industry added 19 Million Net Adds (compare that to about 4 Million net adds per quarter in the US). It's no surprise therefore that the Indian wireless industry is attracting worldwide attention as a hot market for wireless products and services. 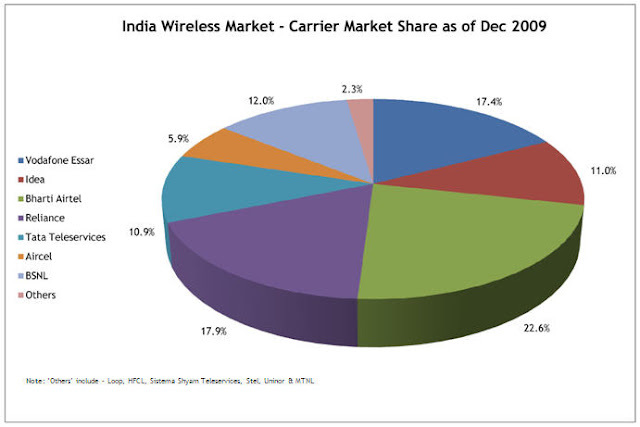 Even though it is widely believed that the Indian wireless market is highly fragmented, a look at carrier market share as of December 2009 shows that while the market is 525 Million strong and still growing, a few clear leaders are emerging. Vodafone, Idea, Bharti Airtel, Reliance and Tata Telservices/DoComo jointly control nearly 80% of the market.